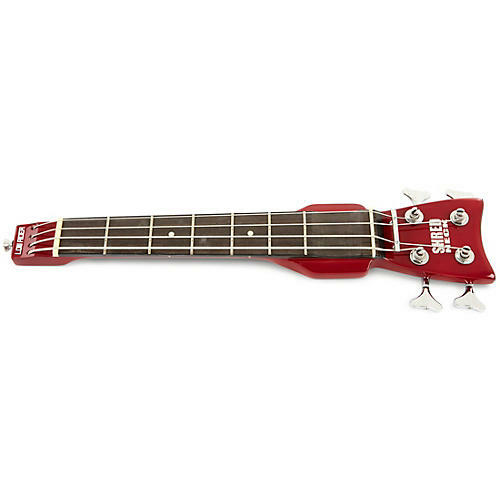 The 4-string Shredneck Bassneck features a rosewood fingerboard, dot inlays, and comes with thumb rest wings and a recessed finger-picking route between the 7th fret and nut. Includes a gig bag. The Shredneck is a small, portable practice tool that provides the feel of a guitar, strings and frets. The headstock doubles as the body to provide a "balanced" feel. Allows guitar players to warm up anytime a guitar is not convenient-in a car, train, plane, at the office, before gigs, between sets, watching TV or in anticipation of playing guitar. Use the Shredneck to work on scales, patterns and techniques, practice chord fingerings and movements along with building and maintaining calluses. It is modeled after the first seven frets of a standard electric guitar and for acoustic players. While the Shredneck is strung for right-handed guitarists, it can be easily converted for left-handed players.